This photo came from Andy McVeigh, Burwood FC President (the blonde lad, third from the left) following a trial game request for our Premier League Squad ! Many thanks to Andy for sending this through ! If you have any old photos or memorabilia we would love to get them from you to put up on the site and on our history page. 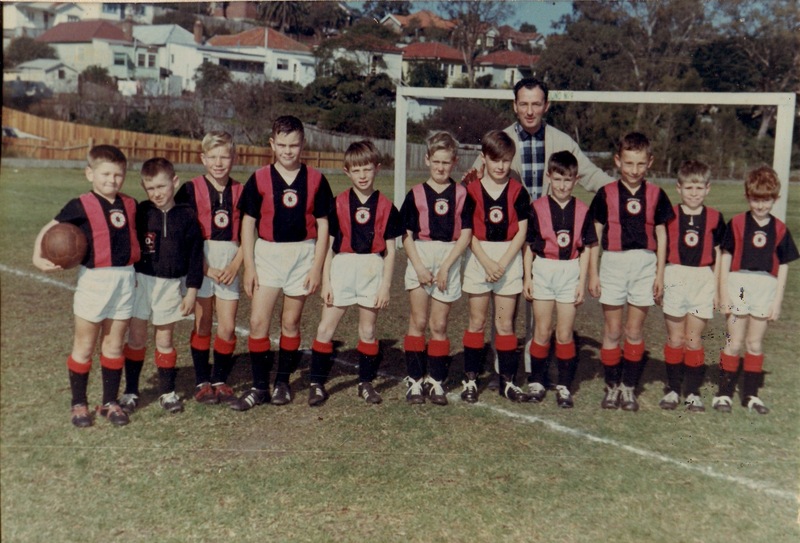 The Redbacks Football Club has a proud history with is formation in 1962. A detailed history of the club is below which tells the story of its humble beginnings, name changes, home ground changes, strip changes and key events in the clubs existence. for the creation of the Roselea Oval. There was a move to amalgamate the Club with the fledgling Roselea Soccer Club but finally the two clubs decided to continue independently.The Club strip in those early days was a shirt made from black sailcloth, with a red vee, white shorts and black socks with red tops. The mothers sewed the shirts at home. The West Epping Soccer Club updated its constitution and changed its name to Carlingford Redbacks Soccer Club. The Club’s first visit to Canberra was in 1972 and has been continued ever since with alternating visits to and from Phillip Club each year. with the Redbacks emblem embroidered on the leg and red socks with two black bands. The Club had grown to 19 teams. The Club fielded 24 teams. The first All Age teams competed for the Club, with most of the players having graduated through the junior ranks, and the Club had swollen to 28 teams. The Redbacks U11/1 team was beaten in the 1975 Grand Final of the Champion of Champions competition. The Redbacks U12/1 (formerly the U11/1’s) team became the Club’s first Champion of Champions winner.The Club had grown to 32 teams. The Club fielded 31 teams.The U17/1 team lasted to the semi-finals of the Champion of Champions whilst the U8/1 team lost their chance to become our second Champion of Champions by losing the grand final 0 – 1 on a goal scored in the last 3 minutes.The decision was made to build a Clubhouse at Roselea Oval. in the Gladesville Hornsby Football Association. The Club unanimously voted to change the name of the Club from Carlingford Redbacks Soccer Club to Redbacks Football Club. The name change reflected the now long standing home grounds at West Pennant Hills which meant that Carlingford was no longer truly reflective of the widespread membership base, as well as the national re-branding of the Soccer code to Football. Following the name change, an updated playing strip was introduced. Shirts remained predominantly red, with pronounced black “swooshes” at the side of the torso. The black shorts added similar red “swooshes”, and re-introduced the Club logo onto the shorts, in addition to the shirts. A massive membership drive on the back of the name change saw over 100 new players join the Club, with around half of those coming into the Minis.